March of the Torches, Havana, Jan. 27. On Jan. 1, 1959, the Cuban people, with the leadership of Fidel Castro, Che Guevara and others, overthrew the U.S.-backed regime of Fulgencio Batista and established a socialist state 90 miles off the coast of Florida. The accomplishments of the Cuban Revolution are many, including free education and health care for all Cubans, a long record of support for anti-imperialist struggles around the world, and enormous relief efforts in response to humanitarian crises, such as the 2014 West African Ebola outbreak. The Revolution has also overcome enormous obstacles, including the U.S.-orchestrated invasion at the Bay of Pigs in 1961, the U.S. blockade (in place since 1960), numerous terrorist attacks by Cuban exile militias based in Florida and the collapse of the Soviet Union in 1991. In spite of this extraordinary endurance, U.S. journalists and politicians constantly declare impending collapse of the Revolution. After 58 years of incorrect predictions, they’re still at it. These voices have only grown louder since the 2011 changes in Cuban economic policy, the 2014 thaw in U.S.-Cuba relations and the death of Fidel Castro last year. So are the naysayers right this time? How strong is the Cuban Revolution? Will it endure? Last month, this writer had the opportunity to visit Cuba and witness the indomitable strength of the Revolution firsthand. 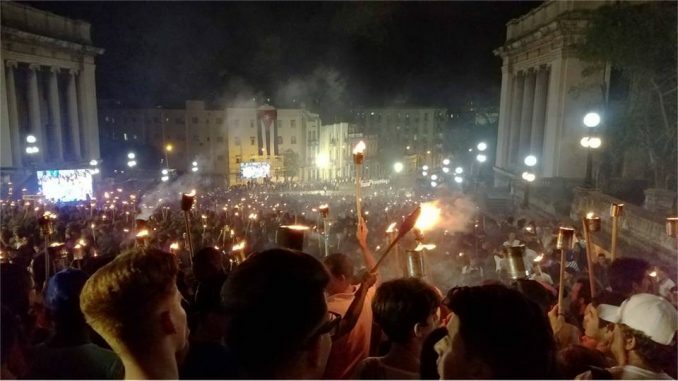 On Jan. 27, thousands of students marched through the streets of Havana in the annual “March of the Torches” to commemorate Jose Martí, the Cuban national hero. The march was first organized at the University of Havana in 1953 to celebrate the 100th anniversary of Martí’s birth. This year’s march was the first since the passing of Fidel Castro and was dedicated to him. Given Fidel’s enormous significance to the Cuban people, one might expect to find his face painted on every surface since his passing. In fact, nothing could be further from the truth: Fidel’s image is almost nowhere to be seen.